Wholesale Silver Gemstone Jewelry : Tucson Gem Show 2010 : Article by Whirled Planet, Inc. The Gem Show was pretty subdued this year, as buyers and vendors deal with the continued collapse in consumer spending. Most vendors I spoke to seemed to be happy with sales volumes, and they were hopeful for the coming year. The hot stones this year seemed to be the same as last year: mystic topaz, kunzite and prehnite. There wasn't any new "must have" stone. There was a huge influx of Chinese crystal, however. In a direct challenge to Swarovski, the crystal beads had rich, colorful coatings and there were a wide variety of size and shapes to choose from. To give an idea of what this could mean for Swarovski, a typical 4mm bicone, the heart of their bead line, sells at retail for about 12¢, though it can be purchased in bulk through some dealers for as low as around 5¢ per bead. 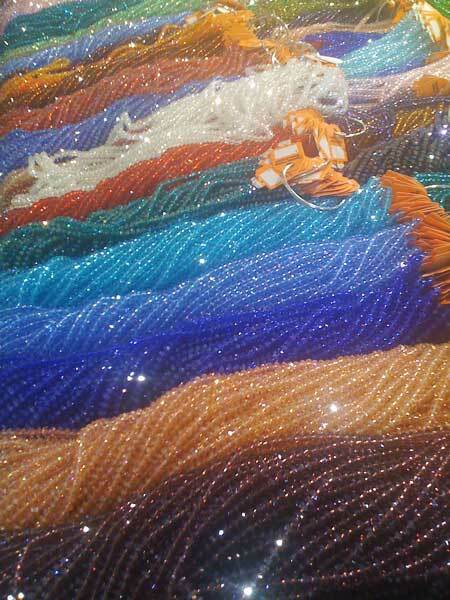 The price most dealers at the show were charging for a strand of 100 bicone 4mm beads was $1. That represents a price advatnage of about 80% over Swarovski. Chinese manufacturers have been trying to get their production right on this type of crystal for several years, but it looks like they have finally succeeded with a decent product and finish. Make no mistake, this crystal is not as good as Swarovski. It is very close, however, and at 80% less than Austrian crystal, I am sure consumers will go for it. The response from Swarovski should be interesting. I am betting they will go for the quality difference, but given what I saw at the show, this probably will not be enough to convince consumers to shell out five times more for a product that is hard to discern from the Chinese version.